The Orontid dynasty, also known by their native name Eruandid or Yervanduni (Armenian: Երվանդունի), was a hereditary Armenian dynasty and the rulers of the successor state to the Iron Age kingdom of Urartu (Ararat). The Orontids established their supremacy over Armenia around the time of the Scythian and Median invasion in the 6th century BC. Members of the Orontid dynasty ruled Armenia intermittently during the period spanning the 6th century BC to at least the 2nd century BC, first as client kings or satraps of the Median and Achaemenid empires who established an independent kingdom after the collapse of the Achaemenid empire, and later as kings of Sophene and Commagene who eventually succumbed to the Roman Empire. The Orontids are the first of the three royal dynasties that successively ruled the ancient Kingdom of Armenia (321 BC–428 AD). The Satrapy of Armenia under the Orontid Dynasty. Little is known about the origins of the Orontid dynasty. Some historians believe that the Orontid kings were of Armenian or Urartian origin. In addition, historians believe the dynasty may have had Iranian origin through a possible relation to the Achaemenids, either through marriage or blood. The name Orontes is the Hellenized form of a masculine name of Iranian origin; Երուանդ Eruand in Old Armenian. The name is only attested in Greek (Gr.:Ὀρόντης). Its Avestan connection is Auruuant (brave, hero) and Middle Persian Arwand (Modern Persian اروند Arvand). Some have suggested a continuity with the Hittite name Arnuwanda. Various Greek transcriptions of the name in Classical sources are spelled as Orontes, Aruandes or Ardoates. The presence of this dynasty is attested from at least 400 BC, and it can be shown to have ruled originally from Armavir and subsequently Yervandashat. Armavir is called the "first capital of the Orontid dynasty" — a few Greek language inscriptions have been found, but the penetration of Hellenistic culture in Armavir seems to have been limited. The precise date of the foundation of the Orontid Dynasty is debated by scholars to this day but there is a consensus that it occurred after the destruction of Urartu by the Scythians and the Medes around 612 BC. Xenophon mentions an Armenian king named Tigranes in his Cyropaedia. He was an ally of Cyrus the Great with whom he hunted. Tigranes paid tribute to Astyages. His elder son was also named Tigranes. Upon the outbreak of hostilities between the Medes and Babylonians, Tigranes had renounced his treaty obligations to the Medes. As a successor of Astyages, Cyrus demanded to be paid the same tribute. Strabo corroborates this in his Geography (xi.13.5). In 521 BC, with the disturbances that occurred after the death of Cambyses and the proclamation of Smerdis as King, the Armenians revolted. Darius I of Persia sent an Armenian named Dâdarši to suffocate the revolt, later substituting him for the Persian Vaumisa who defeated the Armenians on May 20, 521 BC. 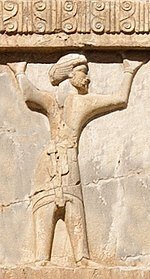 Around the same time, another Armenian by the name of Arakha, son of Haldita, claimed to be the son of the last king of Babylon, Nabonidus, and renamed himself Nebuchadnezzar IV. His rebellion was short-lived and was suppressed by Intaphrenes, Darius' bow carrier. An Armenian tribute bearer carrying a metal vessel with griffin handles. 5th century BC. These events are described in detail within the Behistun inscription. After the administrative reorganization of the Persian Empire, Armenia was converted into several satrapies. Armenian satraps regularly intermarried with the family of the King of Kings. These satraps provided contingents to Xerxes' invasion of Greece in 480 BC. Herodotus says that the Armenians in the army of Xerxes "were armed like the Phrygians." In 401 BC Xenophon marched through Armenia with a large army of Greek mercenaries as part of the March of the Ten Thousand. Xenophon mentions two individuals by the name Orontes, apparently both Persian. One was a nobleman and military officer of high rank, belonging to the royal family; as the commander of the citadel of Sardis, he waged war against Cyrus the Younger and he tried to betray him to Artaxerxes II Memnon shortly before the battle of Cunaxa, but was taken prisoner and sentenced to death by a court martial. Xenophon's Anabasis has a detailed description of the country, where it is also written that the region near the river Centrites was defended by the satrap of Armenia for Artaxerxes II, named Orontes, son of Artasyras, who had Armenian contingents as well as Alarodians. Tiribaz is mentioned as hipparchos (vice-governor) of Armenia under Orontes, who later became satrap of Lydia. Silver Rhyton, Yerznka, Armenia, 5th century BC. Orontes I Gold coin held at the National Library, Paris, dated to 362 BC. In 401 BC Artaxerxes gave him his daughter Rhodogoune in marriage. In two inscriptions of king Antiochus I of Commagene on his monument at Nemrut, an Orontes, called Aroandes (son of Artasouras and husband of Artaxerxes's daughter Rhodogoune), is reckoned, among others, as an ancestor of the Orontids ruling over Commagene, who traced back their family to Darius I. Diodorus Siculus mentions another Orontes, possibly the same, that in 362 BC was satrap of Mysia and was the leader of the Satrap Revolt in Asia Minor, for which position he was well-suited because of his noble birth and his hatred of the king. Misled by his love of power and fraud, he betrayed his fellow satraps to the king. But he revolted a second time, probably owing to his dissatisfaction with the king's rewards, and launched several attacks, which were continued in the reign of the new king Artaxerxes III Ochus. During that time he also conquered and occupied the town of Pergamum, but finally he must have become reconciled with the king. In 349 he was honored by a decree of the Athenians with civic rights and a golden wreath. Many coins were struck by him during the Satraps' Revolt in Clazomenae, Phocaea, and Lampsacus. All subsequent Orontids are his descendants. Darius III was the satrap of Armenia following Orontes, from 344 to 336 BC. An Armenian contingent was present at the Battle of Gaugamela under the command of Orontes and a certain Mithraustes. Diodorus mentions that Orontes was a friend of the Macedonian general Peucestas. Armenia formally passed to the Macedonian Empire, as its rulers submitted to Alexander the Great. Alexander appointed an Orontid named Mithranes to govern Armenia following the defeat of Orontes II. With the agreement at Babylon after Alexander's death (323 BC) Armenia was assigned to Neoptolemus, and kept it till his death in battle in 321 BC. Around 302 BC the capital was transferred from Armavir to Yervandashat by Orontes. Starting from 301 BC Armenia is included within the sphere of influence of the Seleucid Empire, but it maintained a considerable degree of autonomy, retaining its native rulers. According to Polyaenus, in 227 BC the Seleucid rebel king Antiochus Hierax took refuge in Armenian territory governed by King Arsames, founder of the city Arsamosata. Towards the end of 212 BC the country was divided into two kingdoms, both vassal states of the Seleucids: Greater Armenia and Armenia Sophene, including Commagene or Armenia Minor. Antiochus III the Great decided to suppress the local dynasties, and besieged Arsamosata. Xerxes, the satrap of Sophene and Commagene, surrendered and implored the clemency of the king, whom he accepted as his sovereign. Antiochus gave his sister Antiochis as a wife to Xerxes; she would later murder him. Greater Armenia was ruled by an Orontid descendant of Hydarnes, the last Orontid ruler of Greater Armenia (Strabo xi.14.15); he was apparently subdued by Antiochus III the Great, who then divided the land between his generals Artaxias (Artashes) and Zariadres (Zareh), both of whom would claim descent from the Orontid family. In Nemrut Dagi, opposite the statues of Gods there are a long row of pedestals, on which stood the steles of the Greek ancestors of Antiochos. At a right angle to this row stood another row of steles, depicting his Orontid and Achaemenid ancestors. From these steles the ones of Darius and Xerxes are well preserved. In front of each stele is a small altar. Inscriptions have been found on two of those altars. Antiochos expended great effort to ensure that everyone was aware that he was related to the dynasty of the King of Kings, Darius I, by the marriage of princess Rhodogune to his ancestor Orontes. The father of Rhodogune was the Persian king, Artaxerxes. In 401 BC Artaxerxes defeated his younger brother, who tried to depose him. Because of the help Artaxerxes received from Orontes—his military commander and satrap of Armenia—he gave his daughter in marriage to him. Their descendant, the Orontid Mithridates I Callinicus married Seleucid Princess Laodice VII Thea. (Note: Some dates are approximate or doubtful). ^ David M. Lang (2008) . "Iran, Armenia and Georgia". In Ehsan Yarshater (ed.). The Cambridge History of Iran Volume 3: The Seleucid, Parthian and Sasanid Periods, Part 1. Cambridge University Press. p. 510. doi:10.1017/CHOL9780521200929.016. ISBN 9781139054942. ^ Toumanoff, Cyril (1963). Studies in Christian Caucasian history. Washington D.C.: Georgetown University Press. pp. 278ff. ^ (in Armenian) Tiratsyan, Gevorg. «Երվանդունիներ» (Yerevanduniner). Armenian Soviet Encyclopedia. vol. iii. Yerevan: Armenian Academy of Sciences, 1977, p. 640. ^ a b c d Krause, Todd B. and John A.C. Greppin, and Jonathan Slocum. "The Yervanduni Dynasty." The A. Richard Diebold Center for Indo-European Language and Culture at the University of Texas. Jan. 22, 2009. ^ Payaslian, Simon (2007). The history of Armenia : from the origins to the present (1st ed.). New York: Palgrave Macmillan. p. 10. ISBN 978-1403974679. ^ a b Bournoutian, George A. (2002). A Concise History of the Armenian People: (from Ancient Times to the Present) (1st ed.). New York: Mazda Publishers. p. 20. ISBN 978-1403974679. ^ Payaslian, Simon (2007). The history of Armenia : from the origins to the present (1st ed.). New York: Palgrave Macmillan. p. 20. ISBN 978-1403974679. ^ Garsoïan, Nina (1997). "The Emergence of Armenia" in The Armenian People from Ancient to Modern Times, Volume I, The Dynastic Periods: From Antiquity to the Fourteenth Century. Richard G. Hovannisian (ed.) New York: St. Martin's Press, pp. 46-47. ISBN 0-312-10169-4. ^ a b Schmitt 2002. ^ Babaie, Sussan; Grigor, Talinn (2015-03-30). Persian Kingship and Architecture: Strategies of Power in Iran from the Achaemenids to the Pahlavis. I.B.Tauris. ISBN 978-1-84885-751-3. Schmitt, Rüdiger (2002). "ORONTES". Encyclopaedia Iranica. Cyril Toumanoff. "A Note on the Orontids." Le Muséon. 72 (1959), pp. 1–36 and 73 (1960), pp. 73–106. (in Armenian) Hakop Manandyan. Քննական Տեսություն Հայ Ժողովրդի Պատմության (A Critical Study of the History of the Armenian People). vol. i. Yerevan: Haypethrat, 1944. This page was last edited on 19 April 2019, at 05:36 (UTC).